Finite Element Analysis (FEA) is a tool often used in the design, testing and regulatory submission of medical devices and implants. FEA is a useful computational tool that requires knowledge of the device’s detailed geometry and mechanical properties so that stresses and strains can be predicted from the applied external forces and deformations. It can reduce cost by allowing designers and engineers to iterate a device design prior to expensive prototyping and testing. It is, however, an approximation tool used as an intermediate step followed by prototyping and testing. In some cases, customers choose to complete FEA and obtain test parameters that will be used as input for our mechanical testing services. 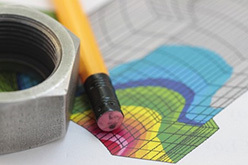 To facilitate the process for our customers, we have partnered with leading FEA consultants to assist customers who do not have ready access to FEA through their in-house resources. 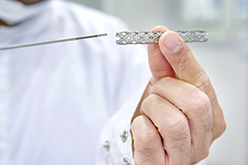 The consultants we refer customers to have extensive experience with FEA modeling for a wide variety of medical devices and use state-of-the-art modeling and analysis software.